It has been proven in the Concours d'Elegance of the Rolls Royce Enthusiasts Club and many others. It´s simple application method - spray onto wet tyre, foam up with a brush and rinse off the resulting brown foam makes it very popular - one Rolls Royce Concours Class winner, Philip Sage, said it reduced his wheel cleaning time by a factor of 6. 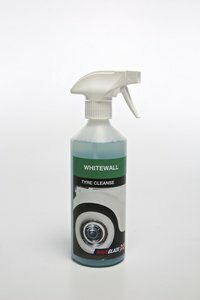 It also works very well in removing brown staining on black tyres, restoring a deeper black hue. It is safe on alloy and wire wheels. Also proven on even old whitewalls which have resisted all other products on motorcycles such as Harley-Davidson.